While this post started as a fork from Compromises on North Broad, it is really a topic unto itself, and a core post of my thinking on how design affects safety. I am calling it (in draft) the forgiving design hierarchy concept of street design workflow. I hope that, as you read, the reasons will become clear. in that order. This is tied to an underlying principle that design consideration scales with modal vulnerability--that is, the more vulnerable a given user is, the greater the design consideration for them should be. This, of course, does not preclude high-quality facilities for the dominant (and in road situations, usually the only) mode of travel; rather, it merely states that first attention should be given to a facility's most vulnerable users. This does not really affect the layout of true roads at all; indeed, it subtly enforces the road/street division in transport hierarchy. What we call "forgiving design" is the set of auto-oriented transportation engineering design guidelines that first emerged with the initial construction of the Interstates. It is an extension of rural design standards, applied with the idea that such standards would improve speed and flow in urban areas. That it is should surprise no one: as I have just pointed out, even in my revised system, most rural byways would stand unaltered. Unfortunately, urban areas, busier and more congested (both good and bad), are hence more incident-prone. The problem is, of course, that current forgiving design principles have proven to be a failure at increasing safety in urban areas--and, even worse, have proven to be a disaster from a safety standpoint in suburban areas (cf. Dumbaugh and Li). Key to the performance of the Dutch cycling network is a concept called subjective safety, the realization that, when it comes to driving usership, the perception of safety is just as important as what is, statistically, "safe". So the optimal approach to generating the prioritization hierarchy above would seem to be to implement subjective safety principles across the more vulnerable modes, fitting forgiving design for automobiles in where it can fit (precisely the opposite of our current approach, which fits in infrastructure where it can fit after the cars are designed in). But--at least in London--subjective safety and forgiving design appear locked in battle, with TfL's flow needs trumping subjective safety needs, despite the lobbying of numerous cycling-advocacy organizations. But the principles of subjective safety are the principles of forgiving design--just applied to a different mode. The whole point of subjective safety, the perception of safety, is achieved by creating an environment forgiving of error; the whole point of forgiving design is an environment forgiving of driver error. This intermodal mesh drives the British conflict: on London's limited road space, who gets the space allocation they need for their approach? Who "wins"? Are they the drivers, accommodated by forgiving design, or the cyclists, accommodated by subjective safety? But it doesn't have to be this way: understanding that they are one and the same allows us to integrate the two elements--forgiving design and prioritization hierarchy--into a single model. Consider a given route. Consider factors such as existing usership(s), current population density, planned population density, distance/mode optimization, origin/destination proximity, etc., to model usership. For roads, none of this matters. But roads also cannot have curb cuts. Design for each user in turn of vulnerability. For each mode, apply forgiving design concepts. For places with low pedestrian volume, but increasing bike volume, for example, a multi-use trail will work. Evaluate whether or not the tax base can support the design. If not, reduce until within this "solvency envelope". which is, of course, largely alien to current transportation engineering workflows. This is just a framework. Many unanswered questions within this framework remain, such as what minimum adequate forgiving design for each mode would be, what optimal infrastructure in several contexts would look like, and even the whole question of designing for enduring financial solvency. In fact, this framework is the core of the research I wish to pursue, largely because I find myself convinced this is the right approach and would like to see it applied and further refined--but as it stands, it is hardly ready-to-go as a framework, and is rather much more conceptual. * With certain exceptions, e.g. suburban arterials, where forgiving design appears powerless against an even more foundational foe, the curb cut. Jon Geeting recently picked up on an implicit idea in my Width, and the Perception of Width article: giving Broad Street the same design standard as e.g. Paris' Ave. Kléber. He has also run further with this idea than I ever conceived, including the idea of putting a BRT lane down Broad. While these are all good ideas in their own right, however, at a certain point Broad Street--especially North Broad--will demand, at a certain level, compromise. The reason for this is a legacy of highway projects that never got built, particularly in the northern suburbs. While this is, as Alon Levy pointed out, good for mass transit (and a major reason why reactivations of the Newtown Branch and Bethlehem Branch (at least as far as Quakertown) are good ideas), it does impose a certain stark reality on Broad Street. 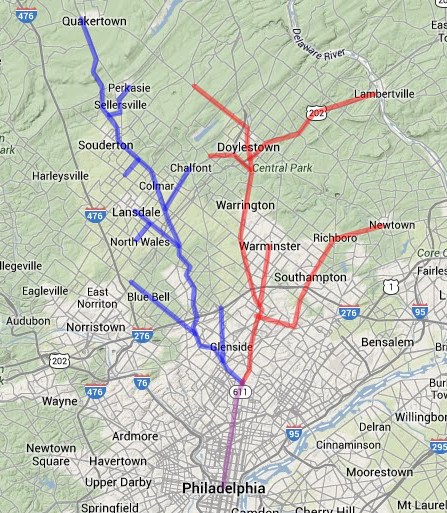 The 309 (blue) and 611 (red) corridors both feed into North Broad. Both of the major highways serving the northern suburbs--PA-611 and PA-309--drain onto North Broad. Because of this, much of the traffic into Center City from central Bucks and Montgomery Counties comes down North Broad: while the Northeast Corridor May function as an escape valve, it only serves a small portion of the northwest corner of this area; commuters from Ambler, Doylestown, Flowertown, Glenside, Hatboro, Jenkintown, Warminster, or Willow Grove have little choice other than SEPTA or North Broad. And of course, commuters from (especially) Churchville and Richboro have none. This makes North Broad's demand far higher than South Broad's, one of the reasons why the current traffic pattern involves converting a parking lane into a through lane at peak. This raises the difficulty that, while an MWB would be easy to implement on South Broad, it is somewhat more difficult on North Broad. While it certainly offers significant traffic calming and safety improvements, it doesn't really address flow interruption congestion (congestion caused by traffic lights), which the peak fifth lane functions as a band-aid for; implementing it as a reversible lane would (a) make it quite difficult to fit everything else onto the street, in addition to being (b) quite ugly. And of course, the real solution to the flow problem--eliminating traffic lights--would be catastrophic for all other users. All of this implies that North Broad requires, at minimum, four through lanes with good light timing minimizing stops, which, of course, dashes any hope of BRT on the corridor. (Not that the 4 or 16, with the subway underneath, really need it.) 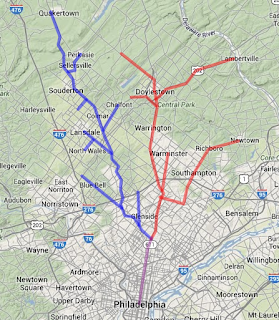 That said, BRT would be useful on several other corridors, such as Erie, Allegheny, Lehigh, and Washington Aves. BRT could be run down the less busy South Broad corridor, but it is, if anything, even less useful there (cf. Reading Between the Lines). So the key is attaining a tradeoff--a balance of priorities. To do this we need some sort of hierarchical modal evaluation criteria. This could be easily abused and turned into a checklist by the same kinds of numbnuts who eviscerated any pretense of urbanism in Syracuse, but having such a checklist exist, and be public knowledge, would be an invaluable tool in project evaluation and project criticism. But what would this entail? To see my answer, partitioned from this post due to increasing lengthiness (not that that's stopped me before) and as subject matter deserving its own post--stay tuned. 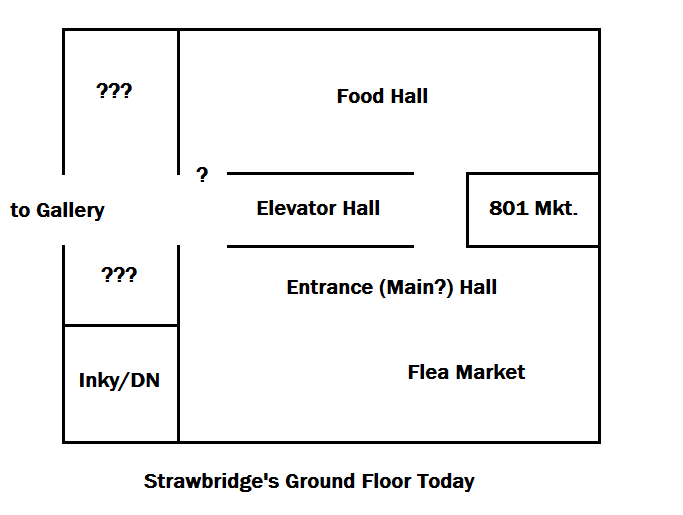 I checked out Franklin Flea this morning, and found out something surprising about Strawbridge's. A lot of people--especially people who were never in it before it closed (like me)--assume (like me) that its ground floor was a single large sales hall. This is not--nor was it ever--true. In reality, Strawbridge's ground floor has several discrete parts: the 1928 structure is bisected on its latitudinal axis by its elevator core; the boar sits where the hallway that serviced this core crosses the one linking the entrance (cosmetics and accessories?) hall with the Food Hall. A secondary hallway runs between the end of the elevator core and the wall between the 1928 structure and the late 1800s-one on the west side. I am unsure, but I think the jewelry department may have run the length of that section's ground floor. (The Department Store Museum directory implies that part of the Men's Store was on the ground floor as well.) 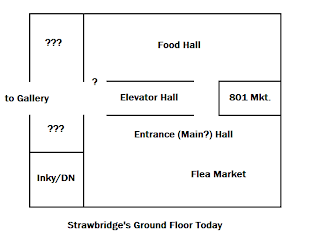 Compared to the open, warehouse-like layouts we expect at hypermarkets and yes, even mall department stores, nowadays, Strawbridge's layout is very difficult to work, and insisting that a single entity take over what remains of the ground floor selling space now that two office lobbies have been carved out of it surely ranks as an endeavor in fruitlessness. Indeed, it is hardly meet to insist that the Food Hall--reportedly being considered for an Eataly--be leased to whatever other entity/ies lease(s) the remainder of the ground floor*. So it appears that the there are three remaining halls and change off the store's central hallway (leading through the elevator lobby). If we assume that Eataly will get the Food Hall, as seems increasingly likely, this means that the rear portion of the 1800s structure, whatever remains of its forward part, and the entrance hall would be in play. The size of the older halls makes them ideal for inline stores, so let us focus on the entrance hall. There are no fewer than three entrances to this hall from Market Street, which implies that it could be split three ways. 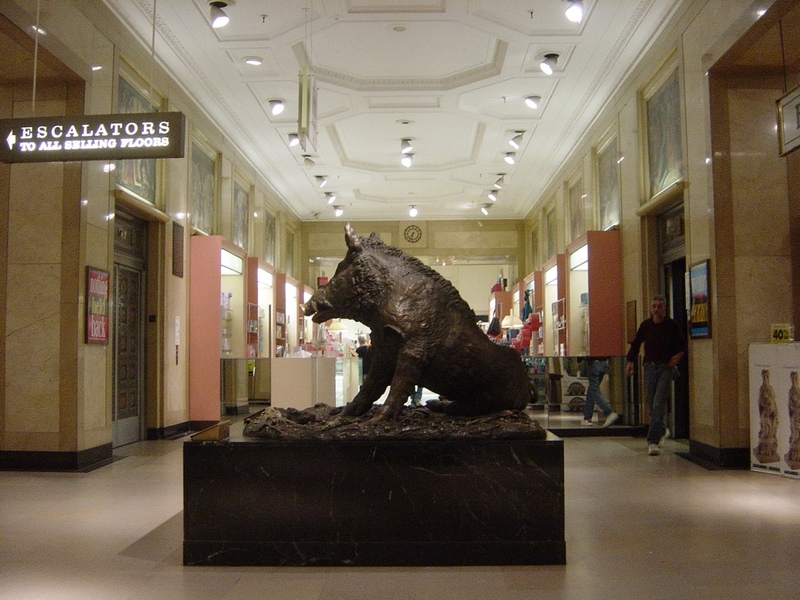 Two, if hall to Eataly via the boar were to be kept open. Or even four--it's that large. But of course, doing so would undermine, perhaps ruin the ground floor's grandeur. And to make things more difficult, the Food Hall does not have its own street entrance. But only a very large presence could fill up the Main Hall. Perhaps the trickiest part of this endeavor is engineering ways to ensure that the entrance hall remains internally linked to the basement and second floor. My position is that until and unless we have a clear tenancy plan that would fill both parts, we should not--cannot--sacrifice these internal linkages. This implies that if (when) Eataly fills the Food Hall, we should seek a plan that links the entrance hall and the elevator hall together. 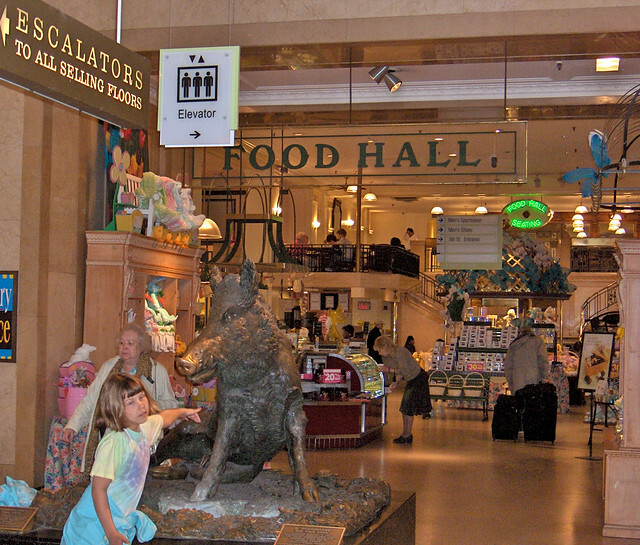 But of course such a plan would cut the Food Hall off from its historical main entrance, in front of the boar. And it's entirely possible the Food Hall isn't as large as I think it is. Another look at the entrance hall, from its SW corner. But--the final note--with the persistent Gallery Bloomingdale's rumor**--and my own Circuitous and Serpentine post of a year ago--whose original concept now bears updating (though it is still valid)--the Gallery has space for three anchors, and if one of them is Bloomie's, that means that the other two just became that much more valuable. Could we be looking, in the near future, at a Gallery anchored by three of the following--? A Gallery able to compete with King of Prussia for high-end inline retailers? Ah well, one can only wish. 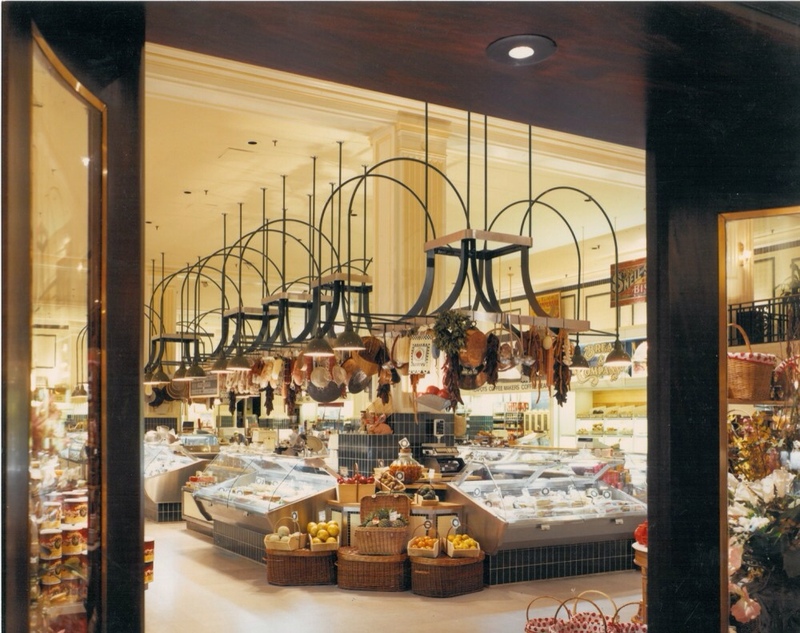 * BTW if anybody knows whatever happened to the original Food Hall fixtures, could there be any way of bringing them back for Eataly? 'Cause those look pretty darned cool. ** The fact that Bloomie's passed up on the Daffy's space (1700 Chestnut) because it's "too small" does not sound like an outlet concept to me. Outlets, like Saks Off 5th, Last Call Neiman Marcus, and eventual Daffy's lessee Nordstrom Rack are typically ~30k sf. The Guadalupe-Lamar corridor was, Project Connect conceded, by far the most popular option at the three public information sessions held throughout the city. Still, the team contended that based on the crowds’ preferences for priorities — congestion and development potential, for example — the Highland and East Riverside routes were actually better fits. The Guadalupe-Lamar corridor was, Project Connect conceded, by far the most popular option at the three public information sessions held throughout the city. There's a reason for this: this is the highest-ridership route in Austin. In European mass transit planning, the rule is: reinvestments get priority. If you have sardine-can packed buses and empty light rail, you're doing something wrong. Light rail, as a mode, has higher capacity than buses and so is best used alleviating pressure on high-demand corridors. That is, a busy bus route is a demonstration of the need for light rail. suggests an intrinsic failure of the planning process. While I agree that we the professionals need to listen to members of the community, I fear this is the point when things start to go to far. If we tried to give the public their every demand, we'd wind up with a fat, blatantly self-contradictory, service-intensive set of asks and not a single new penny to pay for it (indeed, our coffers would likely be lighter). Part of the point of being a professional, of actually spending the time and energy learning the discipline, is to be able to winnow what the public actually needs out from what it thinks it needs. Of course, as Jane Jacobs helpfully pointed out in Death and Life, and Chuck Marohn points out on Strong Towns today, bad professional priorities cause their own problems, so this drives a professional ask: accountability that our priorities and standards are current and reflective of reality. Seemingly in the (misguided) belief that the first half of the 20th century was a golden age in the development of architecture, urban planning, and transportation engineering, however, our professional priorities skew towards prescribing the ideals of Ebenezer Howard, Le Corbusier, etc., and proscribing the traditional development pattern that they rejected. These ideals have, over the past fifty years, proven to be remarkably far from reality. is where the hammer really hits. The Boomer buzzwords "congestion" and "economic development" were never the crowds' priorties--they're the engineers'. In fact, the crowd has made it clear what their priority is: better transit down the busiest route in the city. The problem is that this priority doesn't jive with the consultants' priorities--the Suburban Growth Experiment build-it-and-they-will-come idea instead of maintenance and intensification of a proven success; it doesn't jive with the City's priority, as they wish to service a new-build district; and it doesn't jive with U. of Texas' administration's priority, which for some asinine reason wants to keep the light rail away from the campus's west side--exactly where the greatest student concentration (and hence ridership) is. These all converge in the northeast corridor. So you're consultants with years of experience developing in suburbia caught in pitched battle. On one side you've got proven ridership and public desire for light rail in Corridor A; on the other administrators galore breathing down your necks for Corridor B. So what do you do? Why, you split the difference, of course, and roll out a compromise Corridor C! ...Except that this corridor is like the stroad of transit investments. It's too far from the ridership core that gives Corridor A its strength; it's too far from the underutilized infrastructure that gives Corridor B its strength. What it is, instead, is a corridor that is of use to the people living along it, but fails to capitalize on either of the (opposing) corridors being advanced. It is, in every objective sense, a failure, a futon. Austin already has one mass-transit futon. Does it need another one? Land use is the derivative of the transportation system. What I mean by this is that the nature of the land use system is wholly dependent on the local dominant transportation system. Hence a rail-oriented transportation system sees incredible centralization, pedestrian- and bike-oriented ones a dense spread, and automobile-oriented ones...sprawl. Perhaps "derivative" isn't the right word in a technical sense, but it certainly sounds sexier than "dependent variable". And we want mantra here. We need mantra, because we need to focus on the problem at its core, because the reality is--there's a reason why planners are so often hamstrung, and it's because they're fighting a system dictated by the engineers. So while Euclidean planning standards don't help--parking requirements especially--the place to focus action would be with the engineers, to make it possible to engineer real streets, real platforms for value creation, again. Repeat after me: Land use is the derivative of the transportation system. Land use is the derivative of the transportation system. Land use is the derivative of the transportation system.